Private international law - or the conflict of laws, as it is also commonly known - has evolved in great measure in recent years, due in part to the successes of international agreements in harmonizing the conflict laws of individual countries. 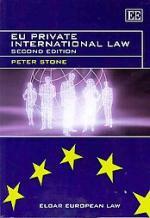 This book focuses on harmonization of conflict laws at the European Community level, which has been driven by the introduction of a series of conventions and regulations. It offers critical assessment of these advances across four main areas of concern: civil jurisdiction and judgments; the law applicable to civil obligations; family law; and insolvency.